PVMBG reported that white plumes were observed rising 15 m above Lewotobi during periods of clear weather from 1 Septmber-6 October. Seismicity declined significantly during the previous three months and became stable. The Alert Level was lowered to 1 (on a scale of 1-4) on 7 October. Lewotobi is composed of the Lewotobi Lakilaki (man) and Lewotobi Perempuan (woman) stratovolcanoes, with summit craters less than 2 km apart on Flores Island (figure 2). The last explosive eruption occurred in May 2003, accompanied by a high level of seismicity (BGVN 28:10). The volcano was apparently quiet through the middle of 2011, except for a brief period of unrest in May 2008 (BGVN 34:01) and March 2009 (BGVN 34:04). The report reviews activity through 7 October 2015, mostly from Pusat Vulkanologi dan Mitigasi Bencana Geologi (PVMBG) reports unless otherwise noted. Figure 2. Satellite image from 4 September 2013 showing Lewotobi volcano and associated features on eastern Flores Island: the two stratovolcanoes Lakilaki and Perempuan, and SE flank cone Iliwokar. The crater on the smaller Lakilaki edifice to the NW is 400 m wide, while Perempuan's is 700 m wide. Courtesy of Google Earth; data labels provided by GVP. Seismicity increased during 26-31 August 2011, and plumes of "smoke" rose 15-50 m above the Perampuan crater rim. Based on the seismic data, the Alert Level for that crater was raised to 2 (Caution) (on a scale of 1-4) on 31 August. Increased seismicity and visual observations at Lakilaki after 17 September 2011 prompted PVMBG to raise the Alert Level to 2 for that cone as well on 22 September. Diffuse white plumes rose 15 m above the crater. At Alert Level 2 people are prohibited from going within a 1-km radius of the respective volcano. Diffuse white plumes again rose 15-25 m above the summits of both craters during January-March 2012. Seismicity at both fluctuated, but had declined overall during September 2011-March 2012. The Alert Level at both was reduced from 2 to 1 (Normal) on 29 March 2012. Another period of increased seismicity on 28 September 2013 prompted PVMBG to again raise the Alert Level of Perempuan to 2. Based on analysis of satellite images and wind data, the Darwin Volcanic Ash Advisory Centre (VAAC) reported that on 6 October 2014 a narrow, low-level ash plume from Lewotobi rose to an altitude of 3 km and drifted 185 km WNW. However, PVMBG did not report activity of any kind or raise the Alert Level. MODVOLC thermal alert pixels for that date showed a broad area on the E flank with 15 scattered anomalies extending to the shoreline, and three pixels the day before located just SE (figure 3). An alternate hypothesis is that fires spread NW due to prevailing winds, sending a low-level plume in that direction. Figure 3. MODVOLC maps showing thermal alert pixels at Lewotobi on 5 October (left) and 6 October (right) 2014. Courtesy of Hawai'i Institute of Geophysics and Planetology (HIGP), MODVOLC Thermal Alerts System. White plumes were reported by PVMBG to be rising 15-20 m above Lakilaki during periods of clear weather from 1 February to 17 March 2015. Seismicity increased significantly on 13 March, especially the number of volcanic earthquakes and shallow volcanic earthquakes; harmonic tremor, tornillo events, and tectonic events were also detected. On 17 March the Alert Level was raised to 2. On 7 October 2015, PVMBG lowered the Alert Level to 1, based on visual observations and decreased seismicity over the previous three months. Clear weather revealed white plumes rising 15 m above Perempuan during 17 July-25 August and 1 September-6 October 2015. Though the Alert Level had been raised on an unreported day, seismicity declined significantly after 1 August, and on 27 August, the Alert Level was lowered to 1. Information Contacts: Pusat Vulkanologi dan Mitigasi Bencana Geologi (PVMBG, also known as CVGHM, Center for Volcanology and Geological Hazard Mitigation), Jl. Diponegoro 57, Bandung, West Java, Indonesia, 40 122 (URL: http://www.vsi.esdm.go.id/); Darwin Volcanic Ash Advisory Centre (VAAC), Bureau of Meteorology, Northern Territory Regional Office, PO Box 40050, Casuarina, NT 0811, Australia (URL: http://www.bom.gov.au/info/vaac/); Hawai'i Institute of Geophysics and Planetology (HIGP), MODVOLC Thermal Alerts System, School of Ocean and Earth Science and Technology (SOEST), Univ. of Hawai'i, 2525 Correa Road, Honolulu, HI 96822, USA (URL: http://modis.higp.hawaii.edu/). PVMBG reported that white plumes were observed rising 15 m above Lewotobi during periods of clear weather from 17 July to 25 August. Seismicity decreased significantly during 1-25 August. The Alert Level was lowered to 1 (on a scale of 1-4). CVGHM reported that during 26-31 August seismicity at Lewotobi increased. Plumes of "smoke" rose 15-50 m above the Lewotobi Perampuan crater rim; no other significant changes were visibly apparent. Based on the seismic data, the Alert Level was raised to 2 (on a scale of 1-4) on 31 August. Visitors and residents were advised not to approach the volcano within 1 km of the Lewotobi Perampuan crater. On 29 May, CVGHM raised the Alert Level for Lewotobi to 2 (on a scale of 1-4) due to an increase in seismicity during 12-29 May. White plumes typically rose about 25 m above the crater and drifted E; visual observations indicated no changes. A decrease in volcanic activity at Lewotobi during 13-19 October led DVGHM to decrease the Alert Level from 2 to 1 (on a scale of 1-4). Only gas was emitted to low levels and no volcanic earthquakes were recorded. The Darwin VAAC reported that an eruption at Lewotobi on 1 September produced an ash plume to a height of ~2.5 km above the summit that drifted W. Volcanic material caused fires in forests within a 1 km radius of the crater and damaged crops on the volcano's flanks. VSI raised the Alert Level to 4, the highest level. According to news articles, hundreds of people from at least six villages fled their homes for the village of Konga to the E. By 2 September the Alert Level had been reduced to 3. Low-level ash emissions continued at Lewotobi during 2-29 June. During 2-8 June ash plumes reached ~300 m above the summit, and ash fell in the villages of Bawalatang, Duang, and Boru. Lewotobi remained at Alert Level 2 (on a scale of 1-4). On 30 May at 1650 an ash explosion at Lewotobi Lakilaki, a stratovolcano of Lewotobi, sent an ash column to a height of ~200 m above the summit. Ash fell at the observatory post about 5 km from the crater. As of 1 June, Lewotobi was at Alert Level 2 (on a scale of 1-4). On 12 October at 2330 there was an explosion at Lewotobi Lakilaki, a stratovolcano of Lewotobi, that was accompanied by a weak thundering sound. Ash fell as far as 5 km away and an ash column rose ~500 m above the volcano. According to VSI, eruptions at Lewotobi usually occur over an extended period of time, therefore they expect more explosions to take place in the next couple of weeks to months. On 16 October, Lewotobi was at Alert Level 4 (the highest level). A sudden increase in seismicity, from 7 to 60 earthquakes/day, was recorded at the end of March. Activity peaked on 26 March, then gradually decreased. No changes in surface activity were observed. Ash was erupted to 800 m height, and deposited to 7 km NE and 4 km NW, on 11-13 May. Gas emission continued through the end of May, with 84 emission events recorded during the last week. Twelve shallow and seven deep volcanic earthquakes were also recorded during the last week in May. Explosions at the summit crater on 28 May at 1615, 1840, and 1911 produced ash clouds to 300 m, accompanied by thunder-like sounds heard 4 km SW of the crater (at Pos Observatory). Since then, activity has been dominated by gas emissions and explosion earthquakes (figure 1). Explosions emitted ash (12-19 times/week) to 100-300 m high. On 8 and 13 June, lapilli and bombs ejected by Strombolian activity covered the area surrounding the crater. Glow and lava fountaining then steadily diminished through the end of June. Explosion earthquakes were recorded 200-405 times/week, compared to 0-4 deep and shallow volcanic earthquakes, and 5-7 tectonic earthquakes/week. No tremor episodes were recorded. Figure 1. Daily number of earthquakes and explosion events at Lewotobi Lakilaki, May 1991. Arrows represent explosions. Courtesy of VSI. Press releases reported increased activity, with small eruptions occurring around 19 July. One eruption reportedly ejected incandescent material 100 m high, dropping hot ash (smelling of sulfur) onto nearby areas and causing residents to flee. At 1645 on 29 July, a 300-m-high ash cloud extending ~35 km W was reported by pilots on Qantas flight A61. By the week of 14-19 August the volcano was no longer exploding, and gas emissions, 50-100 m high, appeared to be decreasing. Information Contacts: W. Modjo, VSI; ICAO; UPI. Degassing has continued since October, sometimes punctuated by ash ejection reaching 50-150 m above the crater. The number of degassing earthquakes dropped slightly from 246 during the first week of December to 233 in the second week. One B-type volcanic earthquake was recorded during the two-week period. The current phase of activity at Lewotobi Lakilaki began at 0547 on 21 March, when observers noted a vigorous steam plume rising 250 m above the summit. This was noteworthy because when the volcano is in a non-active phase its steam plume rises no higher than ~25 m. On 30 March a rumbling noise was heard and the volcano's status was raised to Level II, or "Alert." The following day observers twice noted ash plumes ~250 m high accompanied by a rumbling noise. On 1 April observers saw such plumes at three different times. From 27 April to 3 May the ash eruption continued. The observed ash was whitish-gray, of weak to moderate pressure, and extending 300 m above the summit. Eruption events were sometimes accompanied by detonations. On 29 April, glowing material was ejected 50-75 m above the crater and it fell over an area with 50 m radius. Thin ash fell over the Boru area the following day at 1600. The seismic record totals for the week showed four volcanic type-B, nine tectonic, four eruption, and nine emission events. Ash eruptions reached heights of 500 m during 4-10 May and were sometimes accompanied by strong detonations. On 7 and 9 May glowing materials were again ejected to 50-75 m heights, falling within a 50 m radius. On 7 May ash fell around the areas of Boru, Riang Boru, Hokeng, and Wolorona. Deposits were ~1 mm thick. Seismic events for the week decreased, with three eruptive and five emission events. From 11 through 17 May ash eruptions continued to reach heights of 500 m and were sometimes accompanied by strong detonations. During the week of 18-24 May emission heights decreased to 300 m and blast sounds became less frequent. Thin ash fell during 19 May on the Boru and Riagulu regions. Lewotobi Laki-Laki erupted at 1000 on 1 July. A strong blast accompanied the eruption. Glowing material fell in a 500 m radius to the N and S, igniting forest fires that extended 2.5 km N of the crater and 500 m S, to the ridge dividing Lewotobi Laki-Laki from Lewotobi Perempuan. Ash emissions reached 1,000 m above the summit and were distributed to the W, SW, and S. The emissions then drifted to the NW, W, SW, and S in an 8-km radius. The settlements of Boru, Bawalatang, and Watukubu reported ash deposits in the range 0.5-1 mm thick. "White, thin-to-thick ash emissions" have continued since the initial eruption, rising ~100 m above the summit. Authorities raised the volcano status to "Level III" (prepare to evacuate) on 2 July. The seismic record for the week 29 June to 5 July reported 266 type-A, 70 type-B, two tectonic, and 31 explosive events. On 12 October 2002 at 2330, an explosion at Lewotobi Lakilaki (a twin stratovolcano of Lewotobi Perempuan) was accompanied by a weak thundering sound that was heard at Hokeng village, 5 km from the summit. An ash column rose ~500 m above the volcano and drifted NW. Ash fell as far as 5 km away, accumulating to thicknesses of less than 0.5 mm. No seismic data were available. Following the eruption, the Alert Level was raised to 2 (on a scale of 1-4). According to VSI, eruptions at Lewotobi usually occur over an extended time, therefore more explosions were expected in the following weeks to months. VSI reported no increase in volcanism in the weeks following the 12 October eruption. Through at least 24 November, a thin white low-pressure ash plume was frequently visible rising 150-250 m above the summit. Lewotobi remained at Alert Level 2. An explosion on 12 October 2002 at Lewotobi Lakilaki, one of the twin stratovolcanoes that comprise Lewotobi, produced an ash column that rose ~500 m above the volcano (BGVN 27:11). Through at least 24 November, a "thin white low-pressure ash plume" rose 150-250 m above the summit. No further reports were issued until May 2003, when the Volcanological Survey of Indonesia reported an explosion at 1650 on 30 May 2003. The resulting ash column reached 200 m above the summit and caused ashfall at the observatory, ~5 km from the crater. Visual and seismic data showed no significant increases during the week prior to the explosion (table 1). On 1 June, two explosion earthquakes and two tremor earthquakes were recorded. The hazard status was set at Alert Level 2 (on a scale of 1-4). Table 1. Seismicity and height of the gas plume at Lewotobi during 20 May-15 June 2003. Courtesy VSI. Activity during the week of 2-8 June 2003 was marked by explosions and ash emissions. Ash plumes reached a maximum height of 300 m above the summit. Seven explosions were recorded accompanied by a blasting sound on 3, 5, and 6 June. Ash fell at Bawalatang, Duang, and Boru villages. Shallow volcanic earthquakes were recorded, but were fewer in number compared to the previous week; there was no record of deep volcanic earthquakes, although tectonic earthquakes were recorded. During the week of 9-15 June, activity was marked by ash emissions, with an ash plume reaching a maximum height of 75 m above the summit. Tremor events were also observed, with the tremor showing an amplitude of 0.5-7 mm. There were no deep volcanic earthquakes recorded, although the numbers of shallow volcanic earthquakes, tremor and ash emissions increased. On 29 May 2008, the Center of Volcanology and Geological Hazard Mitigation (CVGHM) raised the Alert Level for the Flores Island volcano Lewotobi to 2 (on a scale of 1-4) due to an increase in seismicity during 12-29 May. White plumes typically rose about 25 m above the crater and drifted E; visual observations indicated no changes. Explosive ash eruptions and high levels of seismicity occurred during May-September 2003 (BGVN28:06 and 28:10). Seismicity declined dramatically after an eruption on 31 August, and all volcanic earthquakes ceased after 3 September. The absence of reports during October 2003 until mid-May 2008 suggests Lewotobi apparently entered a protracted period of quiescence until May 2008. MODVOLC thermal surveillance of Lewotobi subsequent to the activity of October 2003 has not revealed any significant thermal activity to February 2009. Additional details of 2003 eruption.According to an Agence France-Presse (AFP) news report, an eruption on 31 August 2003 took place at 1935. The article noted that hundreds of people from at least six villages fled E from their homes to the village of Konga. AFP said that volcanic material caused fires in forests within a 1-km radius of the crater and damaged crops on the flanks. On 1 September CVGHM reported to the Darwin Volcanic Ash Advisory Center (VAAC) that an ash plume rose ~2.5 km above the crater and drifted W, but the plume was not detected in imagery. Following that 2003 eruption, according to the daily Jakarta Post, at least 565 villagers living on the slopes of Lewotobi were affected by sulfur and ash emissions. The residents experienced respiratory problems and skin afflictions. A 2008 Jakarta Post article indicated that an estimated 10,000 people live on the slopes of Lewotobi, most of them farming the fertile volcanic soil in the area. Information Contacts: Center of Volcanology and Geological Hazard Mitigation (CVGHM), Jalan Diponegoro 57, Bandung 40122, Indonesia (URL: http://vsi.esdm.go.id/); Hawai'i Institute of Geophysics and Planetology (HIGP) Thermal Alerts System, School of Ocean and Earth Science and Technology (SOEST), Univ. of Hawai'i, 2525 Correa Road, Honolulu, HI 96822, USA (URL: http://modis.higp.hawaii.edu/); Darwin Volcanic Ash Advisory Centre (VAAC), Bureau of Meteorology, Northern Territory Regional Office, PO Box 40050, Casuarina, NT 0811, Australia (URL: http://www.bom.gov.au/info/vaac/); Agence France-Presse (URL: http://www.afp.com/); Jakarta Post (URL: http://www.thejakartapost.com/). Unrest caused authorities to elevate the alert level here to 2 in May 2008 (BGVN 34:01). No ash emissions were reported, as has been the case since 2003 (BGVN28:06, 28:10, 34:01). On 23 March 2009, the Center for Volcanology and the Mitigation of Geologic Disaster (CVGHM) lowered the alert level on Lewotobi from 2 to 1 (on a scale of 1-4). This shift was based on visual observations and decreased seismicity during March. Rarely seen diffuse white plumes rose 25 m above the crater and drifted E. Visitors and residents continued to be advised not to approach the crater. Over the period 1-23 March 2009 a cluster of shallow volcanic earthquakes occurred. Their initial numbers, 5-25 daily, soon declined to 1-5 occurrences per day. The total number of deep volcanic earthquakes did not change, averaging 1-3 daily. No tremor had been recorded since 1 February 2009 and at least as late as mid-2009. The Lewotobi "husband and wife" twin volcano (also known as Lewetobi) in eastern Flores Island is composed of the Lewotobi Lakilaki and Lewotobi Perempuan stratovolcanoes. Their summits are less than 2 km apart along a NW-SE line. The conical Lakilaki has been frequently active during the 19th and 20th centuries, while the taller and broader Perempuan has erupted only twice in historical time. Small lava domes have grown during the 20th century in both of the crescentic summit craters, which are open to the north. A prominent flank cone, Iliwokar, occurs on the E flank of Perampuan. There is no Deformation History data available for Lewotobi. There is no Emissions History data available for Lewotobi. 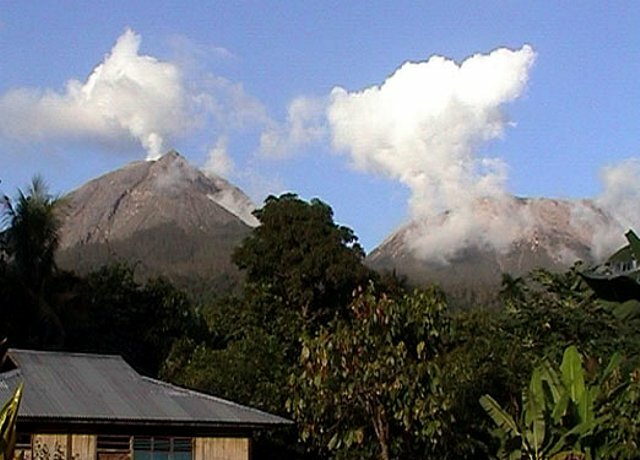 The twin "Husband and Wife" volcanoes of Lewotobi Lakilaki (left) and Lewotobi Perempuan (right) rise above a village on their western flanks. Both the conical Lakilaki and the broad Perempuan volcanoes have erupted during historical time, but the sharper-peaked Lakilaki has been the more active. The twin volcanoes of Gunung Lewotobi present dramatically differing profiles when seen from the SW. The summit of sharp-peaked Lewotobi Lakilaki (left) lies only 2 km NW of the broader summit of Lewotobi Perempuan. Both volcanoes have erupted during historical time. 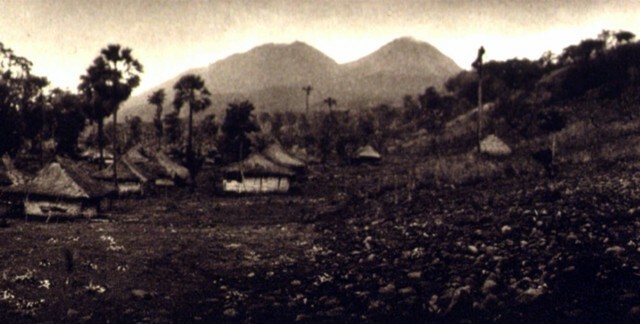 The NE flanks of Gunung Lewotobi volcano rise above the village of Nobo. Flat-topped Lewotobi Perempuan (left) is located SW of its twin volcano, Lewotobi Lakilaki (right). Both of these volcanoes, known as the "Husband and Wife" volcanoes, have erupted during historical time, although Lakilaki, the "Husband," has erupted much more frequently. 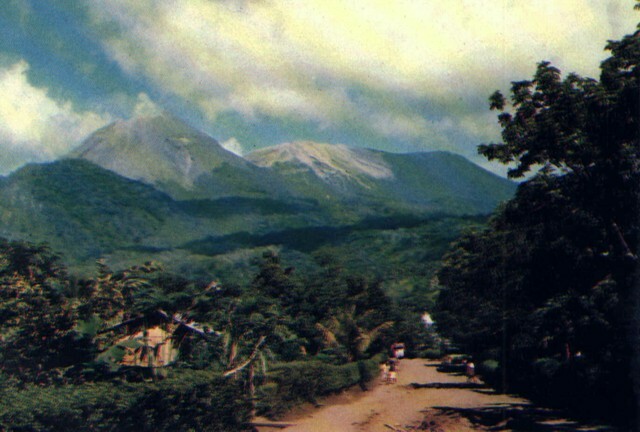 The first historical eruption of Lewotobi Perempuan took place in 1921, when explosive eruptions and lava dome growth were reported in January, May, and December. A steam column rises above the dome in this 1920's view from the NE. The 35-m-high lava dome was emplaced on the floor of crater B, the innermost of two craters at the summit of Lewotobi Perempuan. The new lava dome emplaced in 1921 on the floor of the summit crater of Lewotobi Perempuan is seen from the NW crater rim in 1925. The 35-m-high dome was formed during the first of only two historical eruptions from Lewotobi Perempuan. In contrast, its twin volcano, Lewotobi Lakilaki, has erupted frequently since the 19th century. 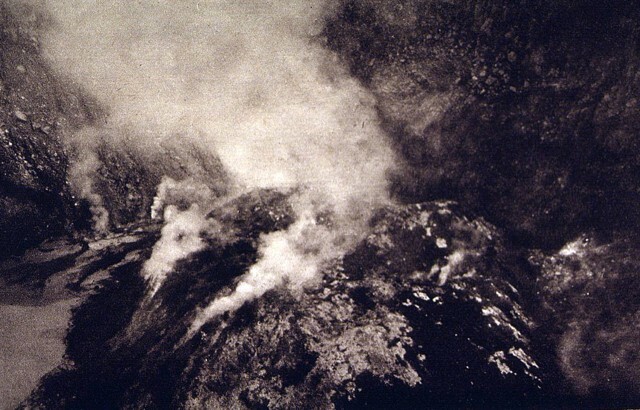 Steam rises above a lava dome emplaced in the summit crater of Lewotobi Perempuan volcano in 1921. The 90-130 m wide, 35-m-high lava dome is seen here from the NW crater rim. The twin "Husband and Wife" volcanoes of Lewotobi Lakilaki (left) and Lewotobi Perempuan (right) rise above forests on their western flanks. The twin volcanoes were constructed along a NW-SE-trending line. Both the conical Lakilaki and the broad Perempuan volcanoes have erupted during historical time, but the sharper-peaked and sparsely vegetated Lakilaki has been the more active. There are no samples for Lewotobi in the Smithsonian's NMNH Department of Mineral Sciences Rock and Ore collection. Large Eruptions of Lewotobi Information about large Quaternary eruptions (VEI >= 4) is cataloged in the Large Magnitude Explosive Volcanic Eruptions (LaMEVE) database of the Volcano Global Risk Identification and Analysis Project (VOGRIPA).